The USED My Sleep Clock includes BedTime, NapTime, and WakeTime Features. 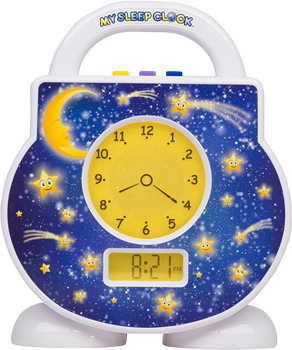 It plays Lullabies, White Noise, and Wake Music (stored on clock; no cartridges). Measures 7" x 5.5" x 2". Power Adapter and Batteries Sold Separately. 6-Month Warranty.